Our fish gigs are made with sharp barbs that are very durable for rocky bottoms. They are manufactured from ¼" stainless steel. 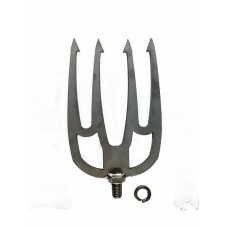 Attach it to our your already purchased harpoon from alligator season or to our 12' Aluminum Gig Pole (FS-12P). THEY FLOAT! Our aluminum welded gig poles are fabricated with receiver threads on each end for easy.. THEY FLOAT! 2' Pole Extension w/ Pole Extension Stud.. THEY FLOAT! 4' Pole Extension w/ Pole Extension Stud.. THEY FLOAT! 6' Pole Extension w/ Pole Extension Stud.. THEY FLOAT! 8' Pole Extension w/ Pole Extension Stud..